The youngest John Deere Gator utility vehicle hire fleet in the UK has just got even bigger. Morris Leslie Event Hire has expanded the fleet at its Woking depot in Surrey to over 120 Gators, and after listening to customer feedback the business has bought 10 XUV 855D S4 four-seater models to complement the fleet. “We have been using the John Deere HPX Gator two-seater models for a number of years now as part of our comprehensive range of plant equipment for events and festivals, and last year we trialled a few four-seater Gators which went down very well with our client base,” says Morris Leslie Group operations director Graham Ogilvie. The Morris Leslie Gator fleet can be found at many shows, TV sets, festivals and events across the UK and Europe, with customers finding them a reliable ‘go anywhere’ utility vehicle. Account manager Sarah Del-Bianco has taken on responsibility for running event hire at the company, and is now looking forward to offering clients a greater choice of 4x4 utility vehicles from Morris Leslie. Morris Leslie has worked closely with local supplying John Deere dealer Farol Ltd on the purchase of this latest batch of Gator utility vehicles. “We are very pleased that Morris Leslie chose Farol Ltd again to expand its Gator fleet, and this strengthens the relationship between our two companies,” says Farol Ltd golf & grass director James Moore. 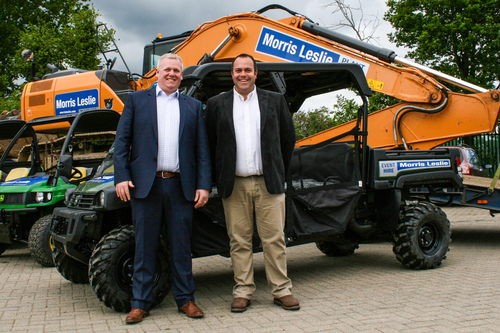 Operating from nine depots across the UK and employing over 200 staff, the Morris Leslie Group has achieved large growth over the last few years and has recently purchased 1300 machines to expand its plant and event hire business, including more than 500 excavators and 450 telehandlers.